It was Star Wars' ORDER 66 that turned the Clone Army against the Jedi, but a new comic confirms that the formerly loyal soldiers had absolutely no choice. In fact, the trigger words that launched them into a Jedi-killing frenzy remained just as effective even after the Jedi Purge. The exact function of this plot twist has been one of the more understandably debated changes made to the Star Wars canon since Order 66 was first shown in Episode II - Attack of the Clones, and with good reason. As those who dislike the updated version will tell you, even George Lucas seemed to endorse the idea that the Emperor's plan didn't rely on "mind control" or "programming," just soldiers completely loyal to the Republic, and not their Jedi commanders. The updated explanation introduced in the Clone Wars series added a literal microchip into the brains of every soldier, but in Darth Vader #17, the actual function of the command - "Execute Order 66" - has never been clearer... if less than satisfying. As lambasted as the Star Wars prequels may be, there was no avoiding the drama and heartbreak of Order 66, the Sith's master stroke in wiping out their ancient enemies, the Jedi Order. Having secretly taken over the creation of a massive Grand Army of the Republic, used his apprentice Darth Tyranus to make it necessary, and trusted the Jedi to attack him in defiance of the Senate, Emperor Palpatine gave a command every Clone Soldier knew by heart. The moment played out in Attack of the Clones without a moment's hesitation, straining believability for some: the Clones who came to know, respect, and love their Jedi commanders in Clone Wars would truly kill them without hesitation? While other fans saw the Clones as soldiers first, following orders that were - ignorant of a Jedi/Sith rivalry - justified. The latter was the canon originally explored, as countless Star Wars novels revealed the internal conflict and struggle of some Clones, refusing to believe their Jedi brothers and sisters were a threat (and even helping secret many of them to safety). But shortly after Disney purchased the Star Wars brand, and announced that almost all expanded universe stories were now Star Wars Legends and not canon, things changed. 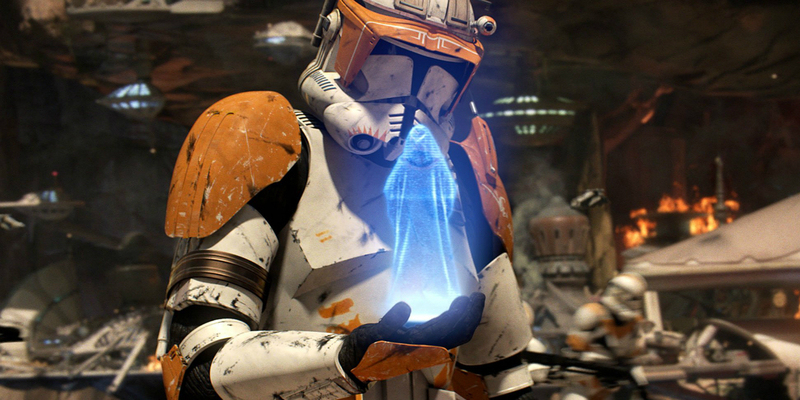 In the final season of Star Wars: The Clone Wars, the Order was revealed to be a special directive of Palpatine's: contained in a microchip, embedded into the brain of every Clone. The plot was even threatened when one chip failed, causing the affected Clone to inexplicably assassinate his Jedi commander. Suddenly, the language that claimed the Clone's programming was meant to make them "more compliant to follow orders" seemed to give way to an actual consciousness-overriding "KILL ALL JEDI" command. In Darth Vader #17, that seems confirmed to be the case, making the Clones seem more like machines than thinking men. The story from Charles Soule and Giuseppe Camuncoli follows the Jedi Padawan Ferren Barr, one of the relatively few survivors of the Purge who gathered a handful of Force-sensitives and took refuge on Mon Cala. After being discovered by the Inquisitorius who serve Darth Vader, Ferren Barr flees... until finding a use for all his research into just how the Emperor pulled off his master plan. Ferren knows Vader's Jedi-hunters for the Jedi they once were, before betraying their Order along with Anakin Skywalker. And as he recites their Jedi names, he casts his own lightsaber aside. A quick flick of the wrist removes the helmets of the black-armored Inquisitor Troopers serving the Inquisitorius, revealing young faces marked with the same red tattoo, apparently brought into service after the Jedi Purge. But nevertheless embedded with the same control chips as their brethren who betrayed the Jedi. So as Ferren Barr utters the exact same phrase, "Execute Order 66," the soldiers of the Inquisitorius - now knowing their commanders' Jedi past - open fire on their superior officers, overriding the chain of command,and allowing Ferren Barr and his student to escape. Ferren Barr has done and said things to potentially question what he's willing to compromise for Jedi revenge, but considering how things play out, it's still hard to blame him for saying the Clones are "merely machines. Little better than droids." Even if that's a reductive belief, based on the orders their own form of Inhibitor chips force them to execute, their instant betrayal of the Inquisitors after Ferren simply utters the phrase spoken by the Emperor is hard to look beyond. Does the comic confirm that any Clone, when presented with a Jedi (past, present, or loyal to the Empire) and hearing the words "Execute Order 66" will mindlessly open fire? Or does the hand wave that Ferren adds to the order give it the weight of Palpatine? No matter the details, the Clones trusted by the Jedi and beloved by fans are completely off the hook for their betrayal. Apparently, they were all subjects of Manchurian Candidate-level programming, overriding rank, allegiance, or friendship in the name of violence without a moment's pause.